The AGM was attended by twenty seven members and as well as reports from Barbara (Vice Chair), Chas (Treasurer) and Karen (Programme Secretary) the meeting saw the election and re-election of committee members. Minutes, including details of the new committee, have been circulated to all members. May we take this opportunity to welcome new members Christine, Angela, Chris and Janet S. We hope you take full advantage of your membership and will enjoy what the Guild has to offer. If you like what you see tell your friends if you don’t…tell us! With the formal business of the day over the festivities began with everyone enjoying an unbelievable selection of food brought in by members. Before the temptation to snooze off the excesses set in we held our ‘show and tell’ session. Many and varied examples of members’ work and discoveries were circulated and discussed. Although not exclusively spinning, weaving and dyeing disciplines work is usually of a fibre or fabric nature. This experience is very enjoyable and valuable as a source of ideas, a way of solving problems and a marvellous showcase of members’ talents. 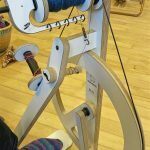 Probably the most outstanding examples this year were the long awaited appearance of Ralph’s new Saori loom and Dawn’s Bliss wheel. 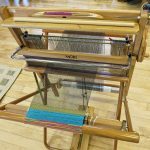 Saori: Just another loom? Oh no, really well thought out design features and adaptable for wheel chair users the Saori even comes with ready rolled warps. On show at Wonderwool and close enough to tempt you to visit Saori is located in Bangor, Gwynneth and offers a short taster session for £10.